Long ago (1955) I saw an old-fashioned acetate recording, supposedly made by Twain himself, on display in the Mark Twain House in Hannibal, Missouri. I was never able to learn anything further, nor what became of that. We do know there used to be some recordings of Twain. In early 1891 he attempted to dictate a new novella, The American Claimant, into a machine rented for him by his friend William Dean Howells. But he quit after "filling four dozen cylinders," complaining, "You can't write literature with it." There also must have been many other opportunities for him to make recordings (Twain was friendly with the best high-tech brains of his day, after all) but apparently none is known to exist today — a curious omission for a master self-publicist whose voice was one of the best-known of his age and who fully expected his reputation to survive for at least another century. 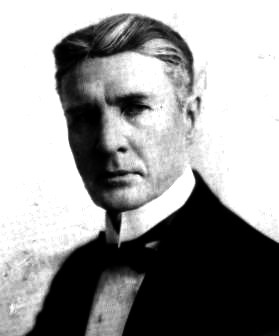 Luckily, William H. Gillette (1853-1937), a favorite actor and playwright of pre-World War I America, happened to be a long-time friend of Mark Twain, and as a sideline he used to do impersonations of Twain and other popular figures. In 1934 Gillette reprised his Twain impersonation for a group of Harvard students — his text was the opening of the celebrated “Jumping Frog” story — and happily for us the performance was captured by Professor Frederick C. Packard, Jr. of the Speech Department. Packard had recently started a record label, The Harvard Vocarium, with the goal of collecting examples of local dialect and traditional ballads as well as recordings of their own work by such contemporaries as Ezra Pound, Robert Frost and e.e. cummings. Thanks to this happy confluence of interests, we have a reasonably authentic (albeit second-hand) experience of Mark Twain’s living voice. Is it a faithful rendition? Almost certainly, it doesn't convey what Twain's audiences heard in the 1870s and '80s; that youthful voice is gone forever — though a sufficiently gifted performer might yet give us a persuasive reconstruction. On the other hand I think Gillette's credentials make it a safe bet this recording really does sound like the white-haired Twain of the 1890s and beyond. Gillette was widely known as a gifted mimic, and he knew Twain for decades as a neighbor and a mentor — in fact, he made his stage debut in an 1875 Hartford production of The Gilded Age. The recording offered here was found online by Jerry Dean, who kindly forwarded it to me. It has been processed to remove some of the hiss and other background noise. For ease of comprehension, I've included a transcription below. When I was young [said Gillette] I traveled around the small towns of New England giving imitations of actors and celebrated people, and among them was an imitation of Mark Twain. I'd lived next to him all my early life. The celebrated story of Mark Twain's, the one that first, I believe, made him famous, was called "The Jumping Frog of Calaveras County" . . .
"Well, there was a man around here in the Spring of '49 named Jim Smiley, and he was the most — worst man you ever saw about betting on anything, that is if he could get somebody to bet on the other side; and if he couldn't, he'd change sides. Anything what suited the other man would suit him; just so he'd got a bet, he was satisfied. "But he was lucky, too, uncommon lucky. There couldn't be no solitary thing mentioned but that feller'd offer to bet on it. If there was a dog-fight, he'd bet on it. If there was a cat-fight, he'd bet on it. Why, if he seen two birds a-settin' on the fence, he'd bet you which one would fly first. If he even saw a straddle-bug start to go anywheres, he'd bet on where he was going and he'd follow that straddle-bug to Mexico before he found out where he was going and how long he was on the voyage. "And he said, 'Well, she’s considerably better, thank the Lord for his inf'nite mercy, and with the help of Providence, she'll get well yet.'" "'Well, I bet you two-to-one she don't, anyhow!' says Smiley, before he thought a word about it!" 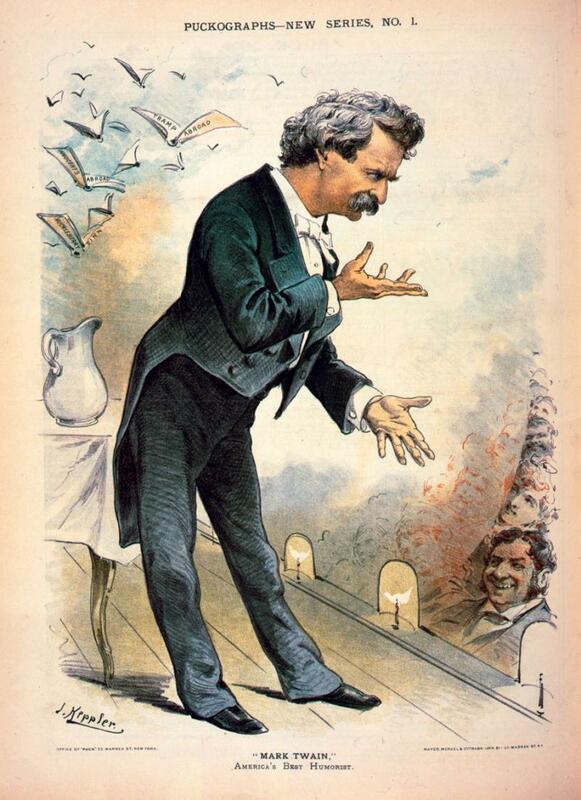 Mark Twain onstage, as rendered by Puck magazine's Joseph Keppler.